Are you looking for top residential interior design firms in Dubai to plan & decorate your house, luxury villa or an apartment? Our best home designers perform a full range of residential interior designing services all around the UAE. Fancy house design company creates unique home interiors that look like a dream house and very convenient to live. Our team of talented and truly passionate professionals realize any of your dreams of the best living space. If you have not yet decided what style you want to have, we help you determine your preferences. We create an interior that reflects client’s individuality and where comfortable and pleasant to be. Our bespoke internal home solutions are made perfectly aesthetically, technically and functionally. We offer to make fashionable appearances for big and small villas, apartments & palaces. Unique and luxurious projects of private houses, mansions and villas from the best luxury residential interior designers in Dubai. We make bespoke home projects. 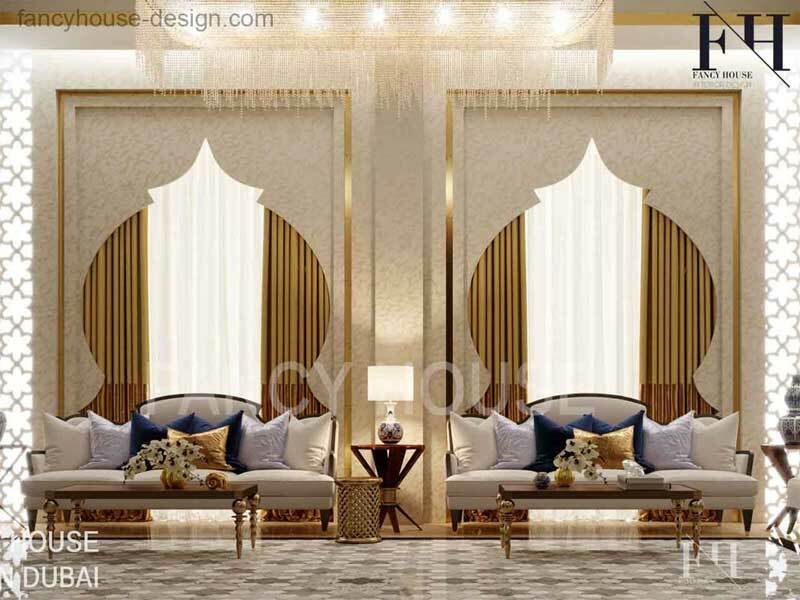 If you are interested to plan and decorate a large living palace, our professional designers are ready to make an excellent solution in modern, classic and Arabic styles. We can create a royal palace impresses with its luxury, wealth and magnificence. Would you like your apartment has a trendy look? We know the features of planning and decoration of large apartments and penthouses: how to make it stylish and comfortable for every day life. Fancy house company is a team of creative and experienced professionals who can transform any premises to beautiful, stylish and very comfortable rooms. Get a residential interior design price list? It is available right here! To bring all up to date ideas and solutions to our clients’ houses we take part in international and Dubai exhibitions. All the best planning practices and decoration technologies of 2019 will be presented in your rooms. We offer fixed prices for designing services. The cost depends on the project size. So it is very easy to know how we charge to you: choose your category and multiply the number of square meters by the presented here price. We charge 150 Dhs per sq. meter for designing premises 500-700 sq.m. Would you lake to get a cost estimation? Just enter the data to the form and get it by email or phone/WhatsApp! 3. How many Square Meters is it? 4. Where is your premise located? 5. Do you need a design project or fit out execution? If you have any kind of questions related to our services, do not hesitant to contact us. You can send us an email or chat with us though the online chat.